I’ve begun writing a series of wrapper classes over WIC (Windows Imaging Component) interfaces, that can easily be used in MFC, ATL, or Win32 applications without worry about directly dealing with COM interfaces. 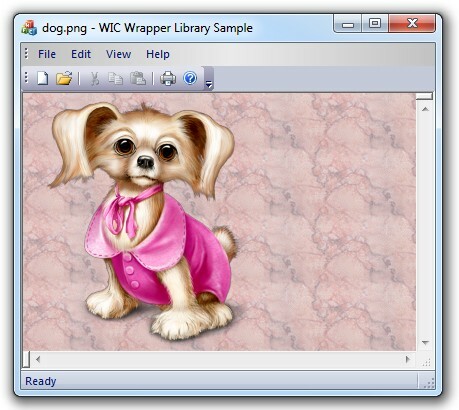 This first version contains basic operation for loading, scaling and converting source image formats that are supported by WIC. WicWrapDLL.lib, both Debug and Release builds, located in \WicWrap\Lib folder. include WicWrap.h in the project source code, e.g in stdafx.h . More details can be found in the demo application, attached below. The demo application is a simple image viewer made in a simple SDI MFC project. Note: the image shown in the sample application is taken from SoftIcons.com site. This entry was posted in MFC, WIC and tagged mfc, WIC, windows imaging component on 2014.03.16 by Ovidiu Cucu.